Tomorrow's future circus stars opened '7' on Wednesday night in an engaging production put together for the Melbourne Fringe Festival 2014. 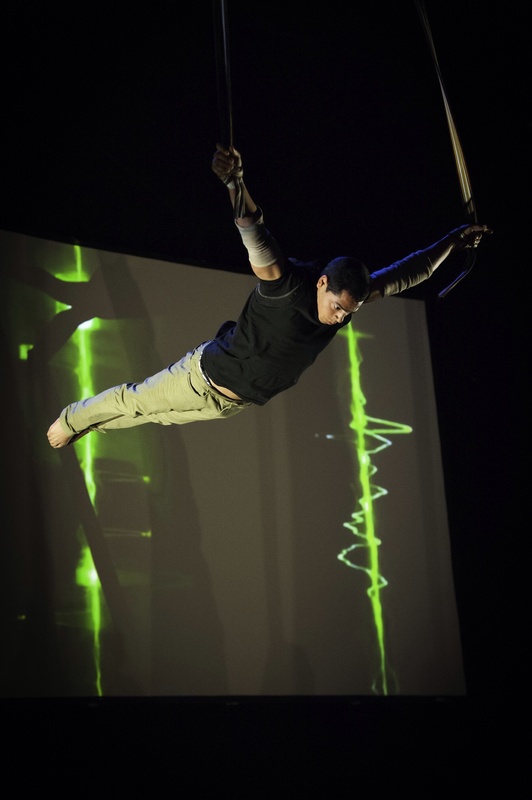 Performed at The National Institute of Circus Arts (NICA) Headquarters in Prahran, '7', an entertaining triple bill performed by second year Bachelor of Circus Arts students, takes you on a journey through three stories intertwined with theatre, dance, acrobatics and lots of laughs. The first scene of On the 7th Day begins with happy faces and a playful dance but soon enters a dark side when air sirens fill the air in what appears to be a world filled with war and fear. Standout scenes include two male performers (Mark Graham and Steven Finnegan) demonstrating simultaneous poise in elevated aerial hoops, and a Pete Doherty look-a-like (Corie Hurry) with a TV antenna attached to his head, performing handstands whilst balancing on a stack of chairs high into the air. 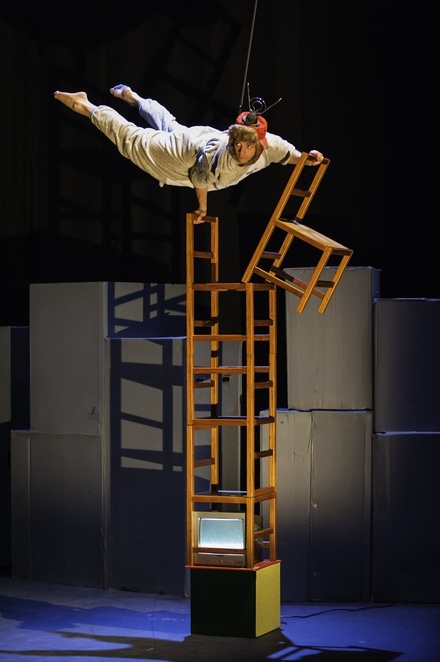 The second performance and my personal favourite, tells the story of a typically chaotic 20-something share house, with circus students tumbling out of a fridge, across a couch, on top of a washing machine, a table and chairs. Apartment 7 presents the best ping-pong manipulation you will see involving a couple of blokes (Marty Evans and Adam O'Connor-McMahon) and two bottles of wine, ending with one dressed in a wedding veil and the two of them distracting a trapeze act with aforementioned ping-pong balls that will leave you giggling. After a 20 minute interval, the final act #ashtag7 places emphasis on the sad reality of our social media driven world where smart phones are attached to our being, and social media has replaced our connection with each other. It is here you see a nerve wracking High Wire and outstanding Cloud Swing performance (by Alex Jean) high above the audience. All NICA's performances demonstrate highly skilled capabilities presented by NICA students, no matter what stage they are through their degree, and '7', albeit filled with little nervousness, is a perfect example of that. NICA once again presents a polished and enjoyable show highlighting the strength and determination of Australia's future circus performers. 7' will run from 24 - 27 September and 1 - 4 October 2014. Book your tickets at melbournefringe.com.au or by calling (03) 9660 9666 and keep an eye on NICA's website for future performances. Not to be missed.